– Sit in the chairs yourself and see how this looks, works and feels! 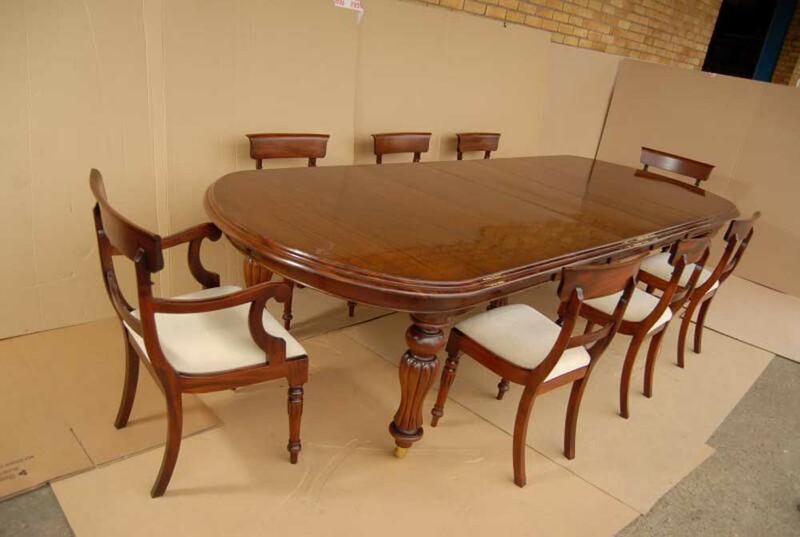 You are viewing a stunning English Victorian style 14 foot dining table with a matching set of 10 mahogany Regency dining chairs. I hope the photos do this stunning set some justice – it really is better in the flesh. Eating together whether with family or friends is probably the most important thing we can do – so why not do it in total style and quality with a table that will last for generations? We appreciate it’s quite an initial outlay but this will last for centuries hence making it a great investment and family heirloom. It was hand made here in England to centuries old traditions and the quality is out of this world. 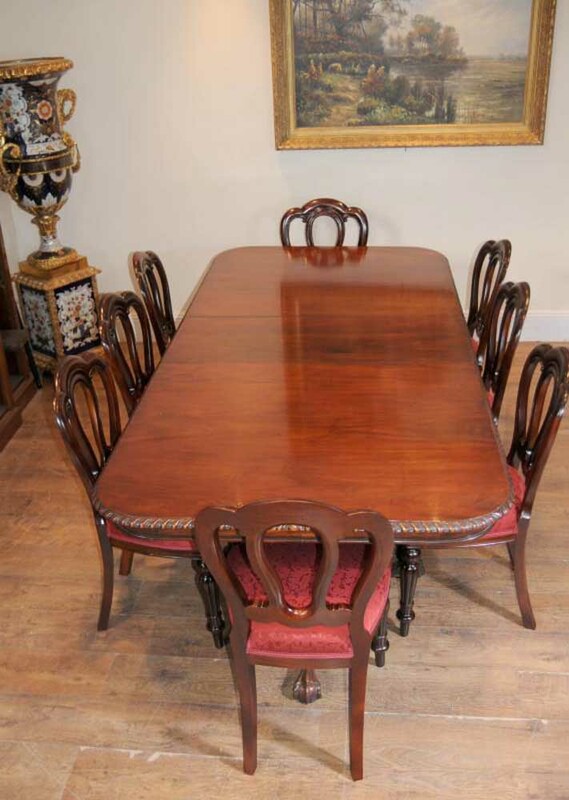 This can be viewed in our large Hertfordshire warehouse / showroom – please contact us if you would like to view. If you are futher afield I hope the photos are sufficient! The table is a Victorian extending diner that works by a winding mechanism at one end (please see close up photo). The table actually would seat 12-14 people easily. The table has four leaves each measuring 18 inches so there are numerous different combinations with this table. A leaf is an extra section of the table you can drop in. There are two D ends at either end of the table each measuring 4 feet. You could have just the two D ends together and the table would be round. 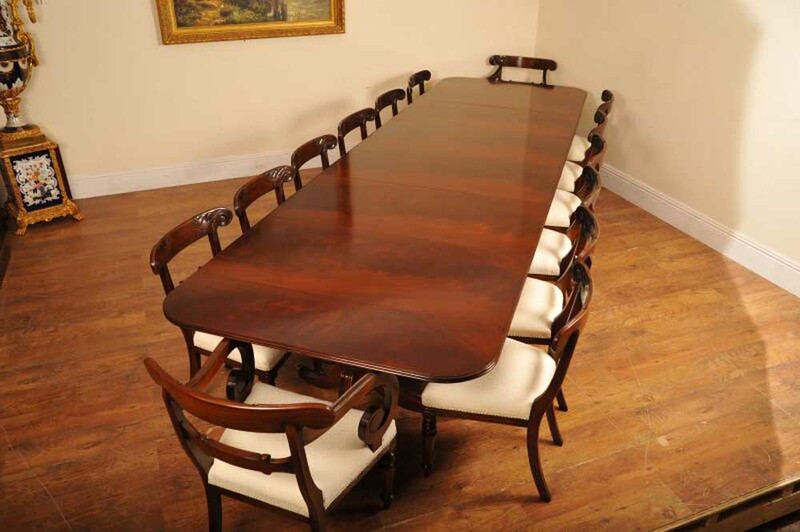 Fully extended it is 14 feet long – and this would sit 12 people more than comfortably, perfect for large scale dinner parties and functions. Then of course we have the set of ten English Regency style dining chairs hand crafted from the finest mahogany and with the distinctive rosette carved to the backsplat. The Regency style is famous for it’s classic design ethos of cool understatment, making them perfect for contemporary and classic interiors. 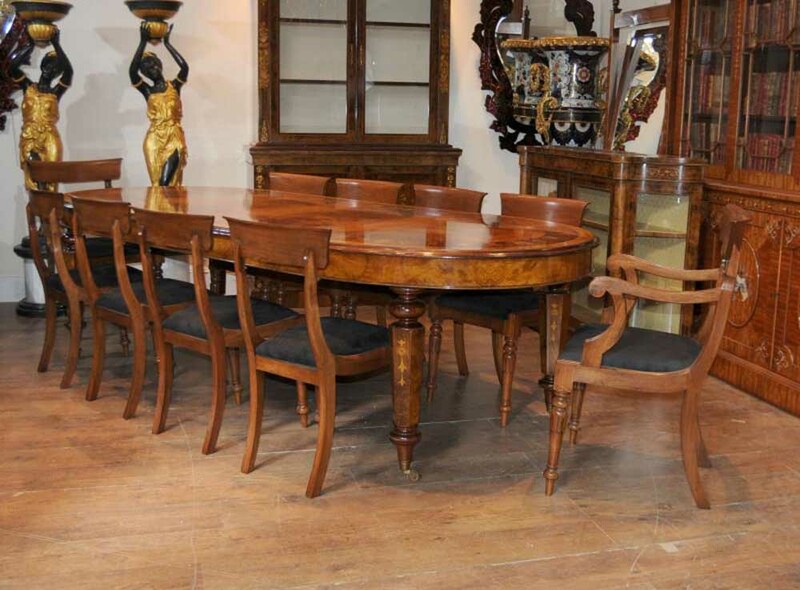 The set consists of 2 arm chairs and 8 side chairs and would make for an out of this world dining set. The chairs are solid and sturdy and very comfortable to sit on with the cushioned seats. There are no wobbles to the joints. 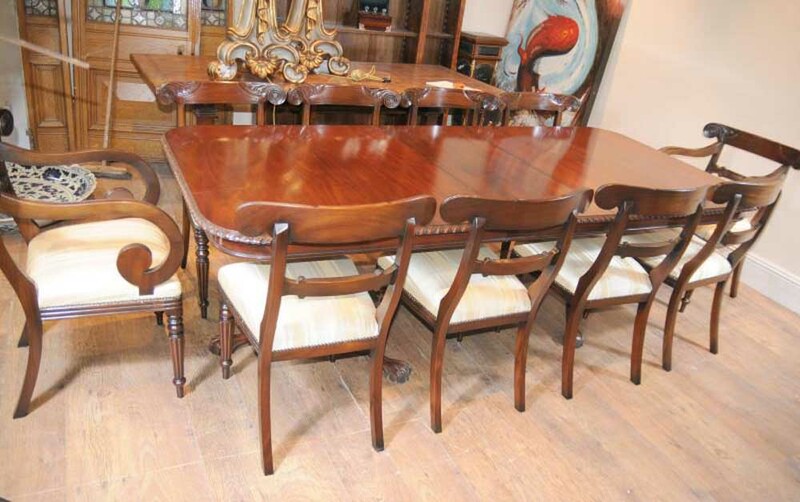 We bought this set from a dealer in Royal Tunbridge Wells, Kent and will ship to anywhere in the world. The seats have been repholstered so are free from any previous owners smells such as pets and smoke, always a bonus. The chairs feature some lovely hand carved details including the hand turned legs and the flutted back splat. These are a gorgeous set, built to last and ready to offer you generations of happy service.